Location of Mount Prospect in Cook County, Illinois. Mount Prospect is a village in Elk Grove and Wheeling Townships in Cook County, Illinois, about 20 miles (32 km) northwest of downtown Chicago, and approximately 4 miles north of O'Hare International Airport. As of the 2010 census, the village had a total population of 54,167. Mount Prospect is located at 42°3′56″N 87°56′10″W﻿ / ﻿42.06556°N 87.93611°W﻿ / 42.06556; -87.93611 (42.065427, -87.936217). According to the Köppen climate classification system, Mount Prospect lies within the Humid continental climate zone (or Dfa) in the warm summer type. The village experiences warm to hot and humid summers and frigid, snowy winters. The village lies within U.S.D.A Hardiness zone 5b, along the fringe of zone 6a. As of the census of 2010, there were 54,167 people, 21,836 housing units, and 14,544 families residing in the city. The population density was 5,310.5 people per square mile (2,050.4/km²) and the housing unit density was 2,140.8 per square mile (826.6/km²). The racial makeup of the city was 77% White, 11.7% Asian, 2.4% Black, 0.4% Native American, 0.01% Pacific Islander, 6.5% from other races, and 2% from two or more races. Hispanic or Latino of any race were 15.5% of the population. Out of the 21,836 housing units, 32.9% had children under the age of 18 living with them, 58.3% were married couples living together, 8.6% had a female householder with no husband present, and 29.3% were non-families. 24.9% of all households were made up of individuals and 12.0% had someone living alone who was 65 years of age or older. The average household size was 2.63 and the average family size was 3.15. In the village, the population was spread out with 25% age of 19 and under, 12% from 20 to 29, 14% from 30 to 39, 14% from 40 to 49, 14% from 50 to 59, and 21% who were 60 years of age or older. The median age was 39.7 years. The population consisted of 49.3% males and 50.7% females. A census survey conducted between 2005 and 2007 estimate the current median income for a family to be $81,574. Males had a median income of $44,585 versus $32,218 for females. The per capita income for the village was $26,464. About 3.1% of families and 4.6% of the population were below the poverty line, including 6.2% of those under age 18 and 3.7% of those age 65 or over. In 2008, Mount Prospect was voted the best city in which to raise children. Companies based in Mount Prospect include Cummins Allison, NTN USA and Rauland-Borg. The former United Airlines headquarters in Elk Grove Township was annexed into Mount Prospect in the 2010s. Mount Prospect has a number of distinct and award-winning[which?] school districts. It has multiple districts that serve the village. Central Mount Prospect is served by Mount Prospect School District 57. North (and somewhat east) Mount Prospect is served by River Trails School District 26. South (and somewhat west) Mount Prospect is served by Elk Grove Community Consolidated School District 59. A very small portion of northern Mount Prospect in its northernmost point is served by Buffalo Grove-Wheeling Community Consolidated District 21. A small part of north central Mount Prospect is also served by Arlington Heights School District 25. A small part of northwest Mount Prospect is served by Prospect Heights School District 23. Township High School District 214 serves all of Mount Prospect; the town is served by multiple High Schools. Small numbers of students attend Elk Grove High School and Buffalo Grove High School. Prospect High School is the only one located within the village. The two Catholic parochial schools (K-8) located within Mount Prospect are St. Raymond and St. Emily. Mount Prospect is also home to one of the three campuses of ITT Technical Institute in Illinois. Multiple park districts serve the town: Mount Prospect, Arlington Heights, Des Plaines, Prospect Heights, and River Trails. In the 1980 movie The Blues Brothers (set in Chicago and vicinity), the car the Blues Brothers ride in is described as being bought at auction from the Mount Prospect Police Department. ^ "Village Board of Trustees". Village of Mount Prospect. Archived from the original on 2015-04-02. Retrieved 2015-03-25. ^ "2016 U.S. Gazetteer Files". United States Census Bureau. Archived from the original on 2017-12-03. Retrieved Jun 30, 2017. ^ "G001 - Geographic Identifiers - 2010 Census Summary File 1". United States Census Bureau. Retrieved 2015-12-19. 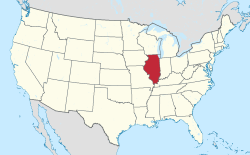 ^ "Historic Average Mount Prospect, Illinois". Intellicast. Intellicast. Archived from the original on 24 September 2015. Retrieved 4 September 2015. ^ N/A, N/A. "USDA Plant Hardiness Zone Map". United States Department of Agriculture Plant Hardiness Zones. United States Department of Agriculture. Archived from the original on 27 February 2014. Retrieved 4 September 2015. ^ United States Census Bureau. "Census of Population and Housing". Archived from the original on May 12, 2015. Retrieved January 31, 2015. ^ "Population Estimates". United States Census Bureau. Archived from the original on 2014-05-22. Retrieved 2015-01-31. ^ "American FactFinder". United States Census Bureau. Archived from the original on 2013-09-11. Retrieved 2008-01-31. ^ "The Best Places to Raise Your Kids". 8 November 2008. Archived from the original on 5 September 2016. Retrieved 29 April 2018 – via www.bloomberg.com. ^ "Mount Prospect annexes part of United campus". Daily Herald (Arlington Heights, Illinois). 2012-05-16. Retrieved 2017-07-08. ^ "Mount Prospect annexes United property, 44 more acres". Daily Herald (Arlington Heights, Illinois). 2017-01-19. Retrieved 2017-07-08. ^ "Village of Mount Prospect 2017 Comprehensive Annual Financial Report". mountprospect.org. Archived from the original on 26 February 2019. Retrieved 26 February 2019. ^ "School Districts". Mount Prospect, Illinois. September 2015. Retrieved 2018-05-30. ^ "School Boundary Map ." Buffalo Grove–Wheeling Community Consolidated District 21. August 28, 2015. Retrieved on May 31, 2018. The Frost boundary is supposed to be lime green but its area is seemingly shown as white instead. ^ "Park Districts". Mount Prospect, Illinois. September 2015. Retrieved 2018-05-30. ^ "BLUESMOBILE COPY AIMS TO REV UP POLICE IMAGE". chicagotribune.com. Retrieved 20 February 2019. ^ Ankerberg, John. "Our Story - Ankerberg Theological Research Institute, John Ankerberg Show". jashow.org. Archived from the original on 24 July 2014. Retrieved 29 April 2018. ^ "Dave Kingman Stats - Baseball-Reference.com". Baseball-Reference.com. Archived from the original on 29 April 2018. Retrieved 29 April 2018. ^ "Tom Lundstedt Stats - Baseball-Reference.com". Baseball-Reference.com. Archived from the original on 23 April 2018. Retrieved 29 April 2018. ^ "Official Website of Ed Paschke". www.edpaschke.com. Retrieved 20 February 2019. ^ Schwarz, Orrin. "Fire releases Prospect's Pantazopoulos". Daily Herald. Archived from the original on 17 February 2018. Retrieved 16 February 2018. Wikimedia Commons has media related to Mount Prospect, Illinois. This list is incomplete. Students in Mount Prospect may be assigned to other schools outside of the city limits.